"Before this game is over, I want every prisoner in this institution to know what I mean by power....and who controls it." There have been a lot of testosterone fests in the movies, but few get to the nitty gritty of wanton comedic violence, pride, dignity and male bonding as does the 1974 Burt Reynolds vehicle, The Longest Yard. Complete with a car chase, this prison/sports comedy still has the power to entertain and get those manly juices flowing. Reynolds stars as Paul "Wrecking" Crewe, a former pro quarterback down on his luck after a point-shaving scandal gets him thrown out of the sport. Little more than a gigolo, he steals his woman's car, knocks her down, makes fun of the police and winds up in the Citrus State Prison. The warden, Rudolph Hazen (Eddie Albert) is a football fanatic who wants his semipro team, the Guardsmen, to win the national title, with Crewe's help. The coach, Captain Knauer (Ed Lauter), has other ideas however, and wants Crewe out of the way altogether. When Crewe suggests to the warden that his team could sharpen up by playing an exhibition game, Hazen assigns him the task of assembling a team out of the prison inmates. Hazen, on a power trip, believes that he can demonstrate his power over the inmates by handing them a defeat on the football field. What he doesn't count on, however, is the fact that the inmates look forward to nothing more than opening a can on the guards without fear of repercussions. The centerpiece is the game itself, which is even more fun than the preparations. Reynolds excels as the slightly smarmy smartass who has the task of turning a bunch of killers into a football team. Michael Conrad (best remembered from Hill Street Blues) is good as his sidekick, Nate Scarboro, another former pro. Eddie Albert is highly unlikeable as the mean-spirited warden. The rest of the cast is packed with veteran character actors and ex-football stars (such as Ray Nitschke), which makes nearly every character entertaining in one way or another. Not to be missed in a very early part is Bernadette Peters, as the oversexed Miss Toot, the Warden's secretary with impossibly big hair. There are also plenty of interesting visuals here too, with a nearly manic multi-screen feature going off during long segments of the climactic game. Though the performances and the camera work are good, it's the football and the rough stuff that make this movie a guys' night classic. The game footage is painfully real looking, including the multiple forward passes to the gonads that Nitschke receives. When you throw in guy triggers like pride, dignity, being a standup guy, sticking it to the Man and all that goes with it, you can't lose. Pick up some brews, your best buds and have a good time spinning up this disc. Image Transfer Review: The anamorphic picture looks decent at best. Colors and blacks are quite good, but there is also a goodly amount of grain, dirt and speckling throughout. Skin tones have a tendency to run to red and orange, however. Definition is good with better than average detail. This isn't a terrific transfer, but it's acceptable, if just barely, for a film that's over 25 years old. Audio Transfer Review: The audio is the original mono. Surprisingly, there is almost zero hiss and noise to be heard. Dialogue through most of the film is pretty clear; during the game sequences some of the lines are less than intelligible, making the inclusion of subtitles a wise extra on this disc. The music comes through just fine. For an old mono track, this is quite good indeed. Extras Review: Other than subtitles and barely adequate chaptering, nothing whatsoever, not even a trailer. The subtitles are apparently done by some subliterate inmates, for we get monstrosities like "reeking havoc." The ultimate guy movie comes to DVD. Yeah, it's a bare bones disc, but you know you want it. 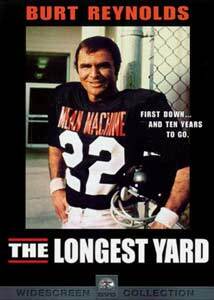 Though it's dated in look and sound, The Longest Yard is still worth picking up for those times when the ladies are away.